Pillar to Post: SUNDAY REVIEW / WALL STREET JOURNAL HUMILIATED? Wall Street Journal editors and reporters interviewed President Donald Trump on Tuesday July 25, 2017 at the White House. The 45-minute interview took place in the Oval Office. The President was joined by several of his senior staff, including his daughter Ivanka and Gary Cohn, director of the National Economic Council. The WSJ is owned by Rupert Murdoch's news empire, which includes Fox News Channel, financial network unit and London's The Times, and locally within New York, the New York Post, along with Fox flagship station WNYW (Channel 5) and MyNetworkTV flagship WWOR (Channel 9). The WSJ did not publish the entire transcript of the interview. By providing selected excerpts it opened itself up to criticism by the media in general. Three vocal media watchers howled loudly. Politico obtained a complete copy of the interview and published it—leaving nothing out. Poynter and the Columbia Journalism Review called the outing humiliating for the Wall Street Journal. Depends. Click on the articles and you be the judge. Columbia Journalism Review’s mission is to be the intellectual leader in the rapidly changing world of journalism. It is the most respected voice on press criticism, and it shapes the ideas that make media leaders and journalists smarter about their work. Through its fast-turn analysis and deep reporting, CJR is an essential venue not just for journalists, but also for the thousands of professionals in communications, technology, academia, and other fields reliant on solid media industry knowledge. The full transcript, unpublished by the WSJ but obtained by POLITICO, is below. 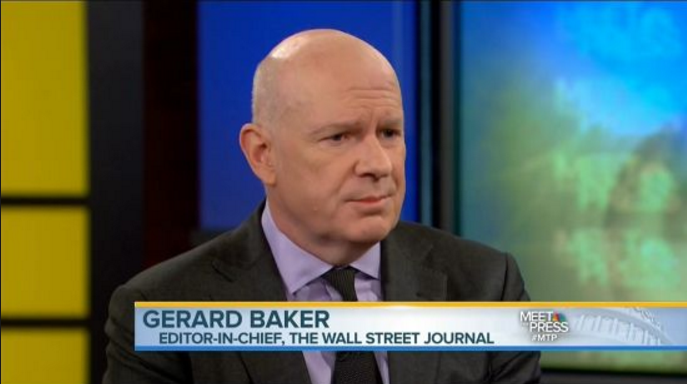 GERARD BAKER [editor in chief Wall Street Journal]: Yes, yes. PRESIDENT DONALD TRUMP: Tax, other things. BAKER: Consumer confidence at a 17-year high. TRUMP: What did you say? TRUMP: Can you believe it? Isn’t that nice. There’s good reason for it, too, and I think we’re doing pretty well on health care. We’ll see. TRUMP: I call it a motion to talk, you know. It’s not a motion to proceed. WSJ: A little bit later, yeah, exactly. TRUMP: A little bit later? WSJ: All depending on McCain’s plane landing. TRUMP: Well, then you have to go and decide on what plan you want, which way you’re going to go. You want to decide on is it repeal or repeal and replace. If it’s repeal and replace, which one do you want to go? Which form of existing conditions? I mean, there’s many things. But once you’re in there, then you can really negotiate. This is actually the heart, though. Once you’re there, you can, you know, Gerard — oh, say hello. IVANKA TRUMP: Hi, Gerard. How are you? BAKER: Oh, hey. How nice to see you. How are you doing? IVANKA TRUMP: I heard you were here. I wanted to come by and say hi. IVANKA TRUMP: How is your Arabella (sp)? BAKER: Oh, very — (inaudible). She just got back from Costa Rica. She was there for two weeks. And how’s — and how’s yours? BAKER: It was nice to see you out in Southampton a couple weeks ago. PRESIDENT TRUMP: So you do, you have a — is it the same spelling? BAKER: I have an — exactly the same spelling, Arabella (sp). Yeah. IVANKA TRUMP: It’s an English name, but it’s not particularly common, so. BAKER: It’s not very common, yeah, no. Actually, we were there first. IVANKA TRUMP: You’re the first. BAKER: Mine is – mine is 15. How old is yours? PRESIDENT TRUMP: So he’s — I think you copied. PRESIDENT TRUMP: You did a good job. IVANKA TRUMP: Yeah, you really did. BAKER: Thank you very much. Thank you. PRESIDENT TRUMP: You did a good job. He’s a good — he’s a good boy. IVANKA TRUMP: They wrote a very nice editorial, so very good. PRESIDENT TRUMP: Thanks, Honey. Stay around if you want. PRESIDENT TRUMP: So we’ll have the vote today at probably 3:00 or so. And we have the head of Lebanon coming in; that’ll be interesting, a little — a little change of pace. We keep it interesting. But so we’ll see what that’s all about. TRUMP: I’d rather see repeal and replace because I — I can do either way. If you remember, it was — you know, it was an idea that I had very early on, repeal. Trouble with repeal is you’ll have millions of people out there that — well, it’s like we just got the highest confidence in many years; you know, people out there that will say, well, you know, how do we know we’re going to have health care? And I hate to do that to people. TRUMP: I’ve always — I’m always concerned about that. I don’t like it. I don’t like it from that standpoint. Now, with that being said, you might be able to make a very good deal because I think there’s a lot of pressure on the Democrats. But the Democrats are nothing more than obstructionists. That’s all they can do. That’s all they seem to be good at. So they’re obstructionists, so what they will do, even though it’s for the good of the country, they will obstruct. They can’t do anything about Obamacare, and I understand that. They don’t want to vote against it. But now, once it’s done — it was my original theory: Once it’s begun, now they can get together. They can do something. But they won’t do that. There’s too much — and this isn’t with respect to me; this is years. This is years, Gerry. I mean, if you look at what’s been going on over the last long period of time. I actually asked people that are political people — I could ask you people — you know, is it the worst you’ve seen it? And I’ve had every single person, no, actually there’s certain other times that were worse. There were certain times in Obama’s administration that were worse. BAKER: The partisanship, you mean? TRUMP: You think — yeah, the partisanship. So, anyway. So I’d rather see — I’d rather see replace. I’d rather add the replace. And we have a very good plan. That’s the one thing, we really have a good plan. We’ve covered a lot of territory. It’s a very, very difficult situation because you move a little bit to the left and you lose four guys, you move a little bit to the right all of a sudden you have a bloc of people that are gone. You have about a one-inch road and it wheels through the middle of the valley, and if it’s even slightly off. It’s a very difficult – it’s a very difficult thing, always has been. You know, if you think, Hillary Clinton, smart person, she was the first lady of the country, her entire life was spent — her entire eight years was spent trying to get health care. Never even came close. Obama — and one thing I have to say, I’m here now exactly six months. Obama took would you say a year-and-a-half? WSJ: He took a year and a half, yeah. TRUMP: Because people were saying, Trump has not produced. I honestly believe for six months I have done more than just about any president when you look at all of the bills that were passed, 42, 43. BAKER: What are you most proud of in the first six months? TRUMP: A lot of things. I think I’m proud of the Supreme Court choice. And that’s not just a nomination, that’s getting him through. I’m very proud of opening up regulations. One of the reasons you see optimism is because people can actually use their land. They can farm their land. I’ve had tremendous and tremendous — look, I had 45,000 people there yesterday. It’s the biggest crowd they’ve ever had, and they were — they were going wild yesterday in West Virginia. But people can actually use their land and they can build. TRUMP: ... and a great secretary, David Shulkin. He’s — he was actually approved 100 to nothing, by the way. BAKER: So, you know, we’re awaiting the outcome of health, we’ll get a vote. I know you want to get tax reform done. Gary, you talked about it. TRUMP: Yes, very much. Very important. BAKER: So can – what’s – I mean, you’ve outlined the principles of tax reform. Can you tell us what you – you know, what you want to achieve fundamentally in tax reform? TRUMP: I want to achieve growth. We’re the highest-taxed nation in the world, essentially, you know, of the size. But we’re the highest-taxed nation in the world. We have — nobody knows what the number is. I mean, it used to be, when we talked during the debate, $2.5 trillion, right, when the most elegant person — right? I call him Mr. Elegant. I mean, that was a great debate. We did such a great job. But at that time I was talking $2.5 trillion. I guess it’s $5 trillion now. Whatever it is, it’s a lot more. So we have anywhere from 4 [trillion] to 5 or even more trillions of dollars sitting offshore. WSJ: A repatriation rate. A 10 percent repatriation rate. TRUMP: Yeah, we want to do personal. BAKER: Yeah, want to do personal taxes and want to make – so whatever cuts in the rates that there are – the marginal rates there are will be balanced by the reduction in deductions, so that the people who benefit from especially at the high end would not – overall would not be net beneficiaries of tax cuts, right? BAKER: And that’s still the aim? That’s still very much the aim? MR. : Yeah, let’s all worry about me. TRUMP: The truth is the people I care most about are the middle-income people in this country who have gotten screwed. And this upward revision, it’s going to be on high-income people. You know, I was with Bob Kraft the other night. He came to have dinner with me. He’s a friend of mine. And as he left, he said, Donald, don’t worry about the rich people. Tax the rich people. You got to take care of the people in the country. It was a very interesting statement. I feel the same way. TRUMP: He had to pay 200 million (dollars) in tax, Gary. Gary wrote a check for 200 (million dollars). TRUMP: No, that was not right. That was not a correct statement, no. TRUMP: We want – look, the job producers we’re going to take great care of, but we have to take care of middle-income people in this country. They built the country, they started this whole beautiful thing that we have, and we have to take care of them. And people have not taken care of them, and we’re going to. WSJ: How would you rate your chances of being able to make those permanent as opposed to temporary? MR. : So if it balances in the 10-year window, it’s permanent. The only way you have to end the tax plan is at the end of 10 years if it creates a deficit. We are working towards a plan that is permanent. To get the capital investment that the president wants – and that’s how you create jobs, and that’s how you create economic growth – businesses have to know it’s a permanent tax change. So that is our objective. WSJ: Does that – [inaudible] – for businesses? MR. : We think – we’ve spent an enormous amount of time working as a group to make sure that we get permanent tax change, simplification, and lower rates. TRUMP: We think we’re going to have tremendous growth. We think money’s going to come pouring into the country. Look, we’re losing companies. People don’t even realize how bad it is, but we’re losing companies every single day where they’re leaving because the taxes are too high. When we do this, we’ll have companies – I know companies that have left. They go to Ireland, they go to other – I own a lot of property in Ireland. They go to Ireland because of these incredible tax rates, and other places, right? We’ll have companies pouring back into our nation. I mean, it’s going to be – you know, it’s going to be beautiful. I hope we can – I hope we can do the 15 percent, actually. By the way, 15 percent is not by any means the lowest, but at least we would go from the highest to one of the lower, lower taxes. MS. : Another area of real focus has been skill training, as well, to ensure increased workforce participation and ensure that people are trained with the skills necessary for the jobs – (inaudible). BAKER: We’ve read a fair bit about that. MS. : So you’ve been covering that a lot, but it’s so important. It’s one of the number one things we hear from the private sector, that they don’t have people to fill the jobs they have and they are looking to fill. So we’re working to close that gap. TRUMP: We’ll have to see. You can call him. But I said, Tim, unless you start building your plants in this country, I won’t consider my administration an economic success, OK? And he’s called me and he says, you know, they’re going forward, three big, beautiful plants. You’ll have to call him. I mean, maybe he won’t tell you what he tells me, but I believe he will do that. I really believe it. But I said to Gary, I said, you know, Gary, you go to certain sections and you’re going to need people to work in these massive plants that we’re getting, that are moving in. Where do we have the people? You know where we have the people? In New York state that can’t get jobs, in many other places that can’t get jobs. And people are going to have to start moving. They’re going to move to Colorado and they’re going to move to Iowa and Wisconsin and places where – like if Foxconn goes to Wisconsin, which is one of the places they’re very strongly considering – but if Foxconn goes to Wisconsin and they have a very low rate and the governor’s done an excellent job, you’re going to have a situation where you got to get the people. But they’re going to start moving. And I’m going to start explaining to people when you have an area that just isn’t working – like upper New York state, where people are getting very badly hurt – and then you’ll have another area 500 miles away where you can’t – you can’t get people, I’m going to explain you can leave, it’s OK, don’t worry about your house. You know, a lot of them don’t leave because of their house. Because they say, gee, my house, I thought it was worth 70,000 (dollars) and now it’s worth nothing. It’s OK. Go, cut your losses, right? BAKER: – chair of the Federal Reserve or to appoint somebody else. Are you – have you reached a decision? TRUMP: I have a lot of respect for her, and I like her. I’ve met her just a couple of times, but I like her. It’s early to make the decision. She doesn’t come up until February/March? MR. : End of June. BAKER: Does that mean it’s possible you would keep her? TRUMP: I do like low interest rates. I mean, you know, I’m not making that a big secret. I think low interest rates are good. I like a dollar that’s not too strong. I mean, I’ve seen strong dollars. And frankly, other than the fact that it sounds good, lots of bad things happen with a strong dollar. BAKER: So she’s definitely – she’s definitely in the running to be replaced this time? TRUMP: I would say – you mean to stay? TRUMP: I would say yes, she is in the running to stay. TRUMP: I actually think he likes what he’s doing right now. BAKER: That’s what he tells us. TRUMP: Don’t tell Gary what I just said. TRUMP: Yeah, there are two or three. But she is – she is in the running, absolutely. I like her. I like her demeanor. I think she’s done a good job. I’d like to see rates stay low. She’s always been – you know, she’s historically been a low-interest-rate person, a believer. TRUMP: I would say sometime by the end of year, probably. BAKER: It would need a confirmation process, which will take time. WSJ: Are there other names? TRUMP: I’d rather not do that. BAKER: That’s the exciting stuff. (Laughter.) That’s the exciting stuff. BAKER: So, Gary, Yellen, and there are other contenders you’re thinking of? TRUMP: Yeah, there are people that are highly respected that I would certainly think about. I don’t know that Gary would want it. I think Gary loves what he’s doing, you know, and he’s doing a very good job. WSJ: On the record. On the record. MR. : This is an interview with the president. This is an interview with the president. WSJ: We’ll call your office. WSJ: This is an interview with the president. WSJ: Can I ask another economics question, while we’re on the subject? BAKER: I’m English. We always make that point. You’re right, yeah. BAKER: We just had a – (inaudible). TRUMP: By the way, are you a member there? TRUMP: I thought that course showed well. WSJ: It’s a gorgeous, gorgeous course. TRUMP: I – well, I saw his first four holes. And I said, man, that’s the end of that, because – you know? TRUMP: Well, he’s actually sort of – he’s in with Tiger and Jack. He’s essentially even, you know, with a number of terms and a number of majors. BAKER: Anyway, are you looking forward to doing a trade deal with the U.K.? WSJ: It would be after, right? They have a time frame. WSJ: The one thing is there’s a – the one thing is there’s a ticking clock with Brexit, so. TRUMP: We have a very good relationship. I have a very good relationship with the prime minister. And we are absolutely looking to do a major trade deal. WSJ: Would the idea be that the trade deal will kick in pretty much as soon as Brexit happens? TRUMP: As soon as it’s appropriate to have it kick in, absolutely. And it’ll be a big trade deal – much, much more business than we do right now, many, many times. TRUMP: There’ll be certain pieces. It’s not – there’ll be certain pieces. I mean, one of the things that – I have a very good relationship with the EU people and all, but they are very, very protectionist. You know, our farmers and others can’t even deal with – you know, you can’t sell in. It’s very unfair. And that’s what I’ve been talking about for a long time. It’s so stacked against the United States. Now, the EU was conceived to the point that they wanted to do something to compete with the United States. Well, you know, you could say that’s a friendly act or an unfriendly act. But it’s very protectionist. Among the most, we have farm products that you just can’t get into the EU. And we don’t do that to them. WSJ: Because we have a lot of financial companies already paring back their numbers, moving people to Frankfurt, already clearing out of London some. Do you think that’s a good idea right now, ahead of this? TRUMP: That’s up to them. But we’re going to have a very good relationship with the U.K. And we do have to talk to the European Union, because it’s not a reciprocal deal, you know. The word reciprocal, to me, is very important. For instance, we have countries that charge us 100 percent tax to sell a Harley-Davidson into that country. And yet, they sell their motorcycles into us, or their bikes, or anything comparable, and we charge them nothing. There has to be a reciprocal deal. I’m all about that. And you know, it’s very interesting, at the border – people may have problems with border, but when you say reciprocal, everybody says, oh, that’s fair. So people have a problem with charging a 10 percent tax, which they shouldn’t have but they do. But when you say you’re going to charge reciprocal charge – in other words, what they charge we’re going to charge – all of a sudden these same people – it might be much more money – but these same people, all of a sudden they’re OK with it. So we have got to be much smarter. You know, our country was built, to a large extent, on protecting our manufacturers. If you go back to Jefferson, you go back to all of these great, great people that ran the United States properly, it was really based on a certain form of tariff and a certain form of protection. We’re just the opposite now. We’re the people that are getting beat up – one of the reasons I think I’m talking to – I’m sitting behind this beautiful desk as opposed to somebody else. TRUMP: Well, we’re waiting – we’re waiting till we get everything completed. We don’t want to do at this moment. We’re going to – we’re going to wait till we get everything completed here. We’re going to see. It’s a very unfair situation. They’re dumping steel in our country. It’s extremely unfair. But we like to keep it as simple as – we like to keep very complicated subjects as simple as possible. So we’re waiting till we get everything finished up between health care and taxes and maybe even infrastructure. But we’re going to be addressing the steel dumping at a very – fairly soon. We – just so you understand – we have massive reports. You know, a lot of this stuff you can’t just walk in and say I’m going to do this. You have to do statutory studies. And then you have to wait 90 days. And then you have to do another. And you have to wait another 20 days. It doesn’t go that quickly. It’s like NAFTA. You know, you have a six-month termination. I was ready to terminate NAFTA. I was looking forward to it, frankly, because NAFTA’s a horrible deal for the United States. And then I got a call from the president of Mexico, who’s a terrific guy, and I got a call from the prime minister of Canada. And they heard I was getting ready to terminate it. And they said: Would you have a meeting with us first? I said, yes. And if you look at my speeches, I’ve always said, either renegotiate it or terminate it. WSJ: Do you think it’s salvageable? Do you think NAFTA’s salvageable? TRUMP: It may be salvageable. WSJ: What do you need for that? TRUMP: I would say – I would say it may be salvageable. But certainly, I have an obligation to give it a shot. TRUMP: I’m looking for fairness. WSJ: But what does that – can you give an example? TRUMP: No, it means – look, our automobile industry has just left us and gone to Mexico – I mean, a big chunk of it. And it’s very unfair for them to take our companies, built their cars, and then sell the car back into our country with no tax. It’s very unfair. They fire all our people in Michigan and Ohio, and they take it, and they build a car. And now they sell the car back in with no tax. It’s not fair. TRUMP: We have a $70 billion trade deficit with China, as an example. WSJ: What does the president of Mexico say when you say that? TRUMP: He’s not thrilled. But that’s OK. I wasn’t thrilled about what he said to me. TRUMP: Oh, there’s not much to disagree with. Look, we have a $70 billion – we have a $70 billion trade deficit. What is anybody saying? With China, we have 350 to 504. Nobody can really define it, deficit. We have a trade deficit of $350 to $504 billion each year. We’re not going to be – it’s just not going to happen that way anymore. TRUMP: Well, we’re doing major studies. Oh, I would be very surprised if they will be – look, we’ve been extremely nice to them. We’ve been extremely nice to them in saying they were compliant, OK? We’ve given them the benefit of every doubt. But we’re doing very detailed studies. And personally, I have great respect for my people. If it was up to me, I would have had them noncompliant 180 days ago. WSJ: Do you expect them to be declared noncompliant the next time? TRUMP: Personally, I do. I do. TRUMP: I think they’ll be noncompliant. I think they’re taking advantage of this country. They’ve taken advantage of a president, named Barack Obama, who didn’t know what the hell he was doing. And I do not expect that they will be compliant. TRUMP: Oh, sure. Sure. Look, I have a lot of respect for Rex and his people, good relationship. It’s easier to say they comply. It’s a lot easier. But it’s the wrong thing. They don’t comply. And so we’ll see what happens. I mean, we’ll talk about this subject in 90 days. But, yeah, I would be – I would be surprised if they were in compliance. STAFF: Mr. President? I’m sorry. We just have time for a few more. TRUMP: So far I can’t say that, right? TRUMP: I’m disappointed in Jeff Sessions, yes. WSJ: Do you want him to leave? TRUMP: Number one, they should go after the leakers in intelligence. I don’t mean the White House stuff where they’re fighting over who loves me the most, OK? (Laughter.) It’s just stupid people doing that. WSJ: The Post, I thought. It was in The Washington Post. TRUMP: It was in The Washington Post. That was not something that I was involved in, other than they did come and they suggested. It turns out it’s – a lot of al-Qaida we’re giving these weapons to. You know, they didn’t write the truthful story, which they never do. So all of those things are very important. But, no, I’m very disappointed in the fact that the Justice Department has not gone after the leakers. And they’re the ones that have the great power to go after the leakers, you understand. So – and I’m very disappointed in Jeff Sessions. WSJ: You can fire him. TRUMP: Well, I didn’t – I wouldn’t have wanted to. But I see the way they go after us on a witch hunt, you know? The Russian – the Russian story’s all an excuse for the Democrats losing. In fact, if you read the book, “Shattered,” they have a whole chapter where they sat the day after the election and they said: Yeah, Russia. It was Russia. And, you know, Trump was involved. OK, the one thing interesting, you never heard me even associated with anybody. But, no, that’s a total witch hunt, the whole Russia story. It’s a hoax. It’s a hoax. We had no collusion with Russia. We never dealt with Russia. People that were on the campaign, like Corey, came in yesterday. It was very interesting. He was being interviewed. He said – I was watching, Corey Lewandowski – he says: I was here from the beginning. And I must be honest with you, I never dealt with any Russians. He was only the campaign manager. I can even look at Hope. She was here from virtually the same day that Corey started, those two. Hope, how many Russians have you seen involved in the campaign, OK? TRUMP: OK? You know, I mean, it’s sad. So they do that. And I say, that’s fine. But then we should really look at real crimes, because real crimes are what Hillary did with 33,000 emails, where she deleted them and bleached them after getting a subpoena. Real crimes are what’s happening and what happened with the uranium deal. And also – I mean, you can say the speeches made while she was secretary of state where they paid her a fortune, Podesta owning a big company in Russia – they talk about me. I have nothing to do with Russia. ANTHONY SCARAMUCCI (? ): (Inaudible) – I said from the podium on Friday that’s there’s nothing to the Russia story. I said on the weekend there was nothing to the Russia story. TRUMP: You know, Anthony came in to see me before it all began. And he said, I want to back you for president. This was before the June 16th day. I said, Anthony, I’m not really sure that I’m running. I’m not sure. I may, but I’m not sure. He said, you got to run, you got to run. I want to endorse you. I said, but I’m not sure. This was a few months earlier than when I ran. And he was leaving and he was disappointed. I say, Anthony, what are you going to do? He goes, I got to back somebody, because that’s the way he is. That’s his personality. And he went to a very good guy named Walker. Then I came after the hedge fund business. So he wasn’t in love with me for a short period of time. And he backed Bush. And that was OK. But his first choice was Trump. I think it’s important to say that because, you know. Is that a true story, by the way? SCARAMUCCI (? ): I was hitting you a little bit – (inaudible) – hedge funds first. HICKS: I was just saying, you self-funded. WSJ: Are you willing for the status quo to continue, though? At what point do you say enough? TRUMP: I’m just looking at it. I’ll just see. WSJ: What about Bob Mueller? TRUMP: It’s a very important, very important thing. TRUMP: Well, we’re going to see. TRUMP: You know, it was very interesting. Trey Gowdy said today – again, he’s a very straight shooter, he’s a good guy – he said, no, I understand the president. He was on Fox. He said: I understand the president. You put a man in office who really wanted that job. I actually said to him – and you know some of my lawyers, it’s not – you know, off the record, it’s not exactly – right? You know some of them. BAKER: I know Marc quite well. TRUMP: Well, but a lot of them. But I put a man in office – and he said this. And he goes in office, then he immediately recuses himself. I fully understand the president. You know, and a lot of people do, a lot of people. He – you know, I don’t go to loyalty. I think it’s disloyal to the office of the presidency, not necessarily me. I think it’s very disloyal to the office of the presidency. And if he didn’t do that, you wouldn’t have all this stuff. You know, you wouldn’t have it. So, just a couple of things before we finish. Just – I’m sure you love Stuart Varney. But he just came out, $4 trillion in value in the stock market. RNC has more than 80 million in cash, whereas the Democrats owe money, OK, although they’re trying to come up with their new campaign. Trust me, it won’t work. And I said it the last time (and I was wrong ?). Immigration went down 78 percent at the border – 78 percent at the border. Kelly’s done a great job. BAKER: You going to veto the Russian sanctions legislation? TRUMP: Well, I haven’t seen them yet. I haven’t seen them in final form. I will say this, Congress, if they’re going to negotiate, they make the worst deals I’ve ever seen. They made NAFTA. They made – you know, they allowed the Iran deal to go through. TRUMP: I make good deals. I don’t make bad deals. I make good deals. So, but, I haven’t made my – I have not seen them. I have to see. By the way, a lot of things have taken place in that agreement that are a lot different from what it was two weeks ago – a lot of things. BAKER: You also – you brought in Anthony, obviously. Are you planning other changes – are you planning other changes in the White House? After you brought in Anthony, are you planning other changes? BAKER: But we can’t expect any more staff changes in the immediate – in the immediate future? TRUMP: But I’m very happy with Anthony. I think Anthony is going to do amazing. TRUMP: You know what? I don’t even think of pardons. Here’s why, nobody did anything wrong. Look at Jared, everybody – we do appreciate the editorial – but everybody said Jared Kushner. Jared’s a very private person. He doesn’t get out. I mean, maybe it’s good or maybe it’s bad what I do, but at least people know how I feel. Jared’s this really nice, smart guy, who’d love to see peace in the Middle East and in Israel, OK? BAKER: Thank you very much. Thank you very much, Mr. President. WSJ: Thank you, Mr. President. Thanks. WSJ: Tom Barrack as Mexican ambassador? TRUMP: I’m thinking about it. What do you think? Do you like him?